Casino and café chain owner Hard Rock International has finalized the purchase of the shuttered Trump Taj Mahal casino, a move that allows the company to finally enter Atlantic City’s casino market. Hard Rock will host a press conference on Wednesday, April 5, to shed light on its plans for the property. 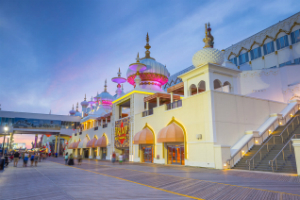 The casino developer and operator has not disclosed Trump Taj Mahal’s purchase price, but it had formerly confirmed that it would invest over $300 million in the property’s complete redevelopment. Spread over 17 acres of land on Atlantic City’s Boardwalk, the complex will reopen doors for visitors and guests as Hard Rock Hotel & Casino Atlantic City. Trump Taj Mahal was originally opened in the early 1990s. The property was then owned by US President Donald Trump. It was heavily promoted as the eighth wonder of the world and was one of the stars on Atlantic City’s casino skyline. Trump Taj Mahal’s recent years of operation were the exact opposite of its glorious days. In 2014, the hotel and casino complex was on the brink of bankruptcy. It was saved by New York investor Carl Icahn who purchased its parent company Tropicana Entertainment in 2015. The businessman was determined to invest a considerable amount of money to revitalize the once very popular casino. However, a more than a month long workers strike in the summer of 2016 incurred a change of plan. Mr. Icahn announced last September that picketers had hurt Trump Taj Mahal’s profitability beyond repair and that the property would be closed in October. Earlier this year, the billionaire investor made it known that he would sale the shuttered complex, if he found a willing bidder. To many’s surprise, a bidder emerged almost instantly and it was one well-recognized in US and global casino circles. Hard Rock has made several attempts to enter New Jersey’s casino market but none have been successful so far. In 2011, the company announced plans to build a casino in Atlantic City, but decided against it shortly after. In 2015, Hard Rock was among the developers to welcome the idea of casino expansion in North Jersey and expressed interest to add a casino at an existing racetrack. However, the construction of casinos outside Atlantic City was voted against by state residents in a 2016 referendum. New Jersey has not been Hard Rock’s only expansion target over the past several years. The company won last fall the bid for the construction of Republic of Cyprus’ first casino. It will work jointly with Hong Kong developer Melco International Development on the ambitious project. Earlier this year, Hard Rock also announced plans to apply for a casino license in Japan, when this becomes possible. The Asian island nation legalized casino gambling in December 2016, paving the way for the construction of up to two integrated resorts within its borders. Hard Rock is only one of the big gambling names to have joined the race for a place in Japan’s casino industry, some of the other being MGM Resorts International, Las Vegas Sands, and Genting Group. Follow us on Facebook and Twitter to keep up with the latest news from the global gambling industry.